West Brom 3-1 Newcastle | NUFC Blog. 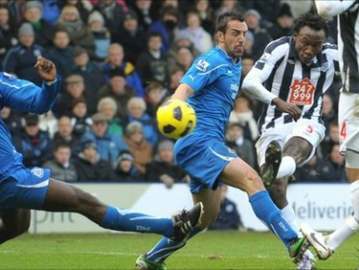 Archive for tag: West Brom 3-1 Newcastle. Newcastle limply surrendered at The Hawthorns yesterday as they were outclassed and outfought by an impressive West Brom side. I don’t want to take anyting away from West Brom as they did play really well, but the disappointing thing is that they didn’t need to play well to get a result such was the shocking performance that Newcastle put in. Every team has off days, as I am sure that most of us will agree, but our off days are starting to happen far too often. We’ve picked up two points from a possible fifteen, which is relegation form, and with tough fixtures coming up I can understand a bit of the doom and gloom that is flying around at the minute. The rumour is that Chris Hughton locked the team in the dressing room for an hour after the final whistle yesterday. The lads were lucky, because if it was me they would still be there now!